Titan’s 6" (152mm) square, 3/16" (5mm) thick post and heavy-duty, dual strut extension arm makes it one of the toughest adjustable posts sets available. 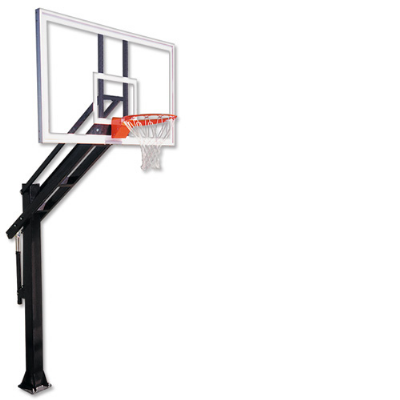 Tubular H-Frame backboard mount with direct goal attachment provides maximum rigidity. Post provides a 4’ (123cm) extension for maximum player safety when set at 10’ (305cm). Crank style adjustment system with a double spring assist allows virtually anyone of any size or age to easily adjust the goal to any height between 10’ (305cm) and 6’ 6" (198cm). Indicator shows the rim height. All pivot points feature welded steel bushings, and post has a welded top cap to provide long-term durability. Entire post and extension finished in durable black powder coat. Post is attached to concrete footing via threaded J-bolt anchoring system to allow perfect pole leveling and easy removal. Post set provided with 72" x 42" (183cm x 107cm) Acrylic Backboard and Outdoor Breakaway Goal.